In about 10 seconds, sharpen knives, (even serrated knives), cleavers, axes, machetes, and many other cutting tools. The large ergonomic handle fits either hand safely and securely. The full length finger guard protects your fingers. Sharpening blades are Diamond Honed Tungsten Carbide for years of reliable use. 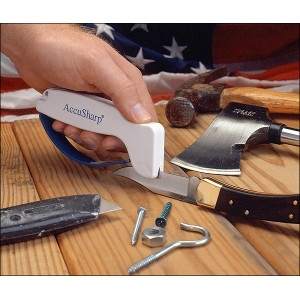 AccuSharp Knife Sharpeners will not rust and can be cleaned with soap and water or in the dishwasher.